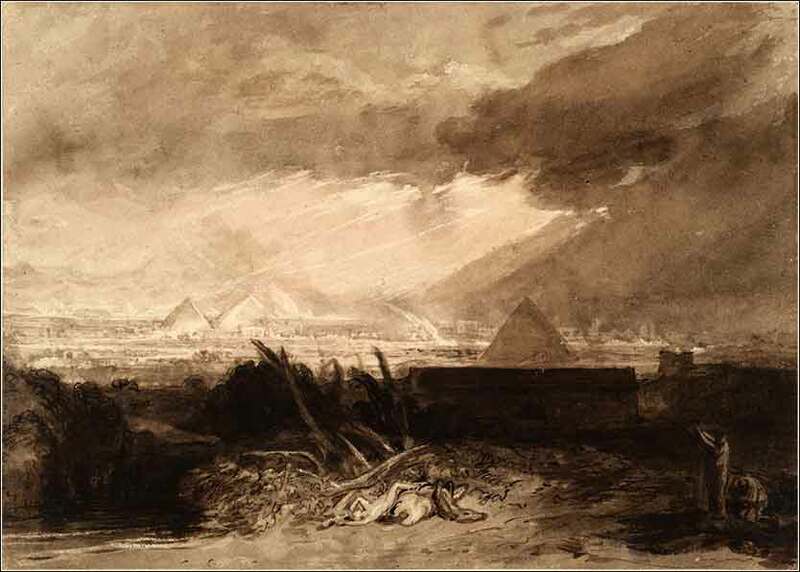 The Seventh Plague, mezzotint by Joseph William Turner, ca. 1807. Turner uses the very absence of color to emphasize the powerful starkness and desolation of death. You might want to maximize this, because the video is extraordinary. Then the Lord said to Moses, “I will send only one more punishment on the king of Egypt and his people. After that he will let you leave. In fact, he will drive all of you out of here. Now speak to the people of Israel and tell all of them to ask their neighbors for gold and silver jewelry.” The Lord made the Egyptians respect the Israelites. Indeed, the officials and all the people considered Moses to be a very great man. Moses then said to the king, “The Lord says, ‘At about midnight I will go through Egypt, and every first-born son in Egypt will die, from the king's son, who is heir to the throne, to the son of the slave woman who grinds grain. The first-born of all the cattle will die also. There will be loud crying all over Egypt, such as there has never been before or ever will be again. But not even a dog will bark at the Israelites or their animals. Then you will know that I, the Lord, make a distinction between the Egyptians and the Israelites.’” Moses concluded by saying, “All your officials will come to me and bow down before me, and they will beg me to take all my people and go away. After that, I will leave.” Then in great anger Moses left the king. The Lord had said to Moses, “The king will continue to refuse to listen to you, in order that I may do more of my miracles in Egypt.” Moses and Aaron performed all these miracles before the king, but the Lord made him stubborn, and he would not let the Israelites leave his country. This is a good point to recall the first time Moses first spoke to Pharaoh in Chapter 5. Pharaoh's reply was, “Who is this Yahweh, that I should obey his voice and let Israel go?” The very nature of God was so different from the Egyptian experience of their inanimate statues that Pharaoh could not grasp it. In his eyes, he was the greatest living power on earth, and his pride is so fixed and absolute that even the nine plagues have not dented it. Exodus is not only history; it is a metaphorical exploration of how pride can operate to condemn a determined atheist to hell. You will hear atheists demanding proof of God's existence or a sign from God; but in fact, when such signs occur, they will be ignored or rationalized. Consider the life of Christ. When He would, for example, heal a sick person who was beyond hope, determined nonbelievers would not only ignore the implications of the miracle, but would also criticize Him for healing on the Sabbath! Chapter 11 also highlights another terrible aspect of life, how people must pay for the actions of their government. All of Egypt is ready to submit to Yahweh; even the highest officials will bow down before Moses, to entreat him to intervene for them. But Pharaoh is an absolute ruler. And we have seen, in recent history, how easily the sin and pride of a single absolute ruler can condemn hundreds of millions to death. Is it fair, that God will kill so many people, including small children, for the actions of their king? One simply cannot apply the idea of "fairness" to God. The human concept of fairness is not a bad thing and often stands, in human affairs, as a rule-of-thumb to implement our concepts of love and justice. But God is not in our control and is not ours to judge. We suffer the damage and ultimate destruction of our bodies, sometimes at seeming random, and it is not "fair". But in this regard, we must always remember two things. 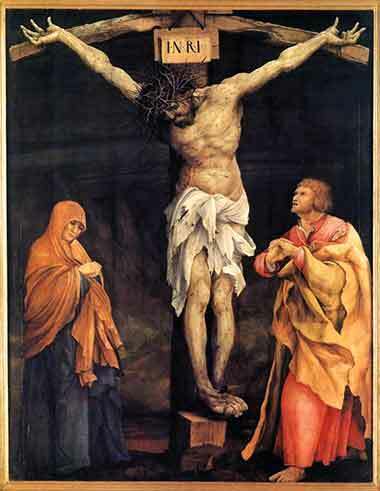 First, Christ Himself was unfairly tortured and executed. And second, in allowing this to occur, He made the death of our bodies almost irrelevant. For by His resurrection, Christ proved His power over mortal death; and by His sacrifice, He promised that we could find the grace to share in His eternal life.